After fretting about whether she'd be able to afford rent, Rep. Alexandria Ocasio-Cortez (D., N.Y.) has moved into a luxury apartment building in the District of Columbia's Navy Yard neighborhood, the Washington Free Beaconhas learned. Her office pushed back against the notion that it was hypocritical for Ocasio-Cortez, who has made housing affordability one of her top policy concerns, to move into a luxury building. A spokesman pointed out that her office also uses a car with an "internal combustion engine that runs on fossil fuels," even though she thinks their use should be eliminated. 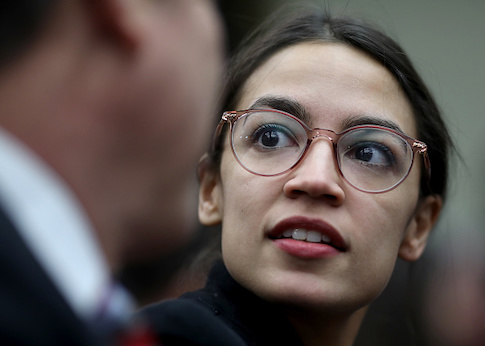 Many sympathized with Ocasio-Cortez's stated difficulty with finding an apartment in D.C., where rents have been on the rise in recent years. Affording a second residence in the capital has proven to be a challenge for lawmakers on both sides of the aisle, with some choosing to live together with colleagues or to bunk up in their congressional office as cost-saving measures. Ocasio-Cortez's living situation was frequently misrepresented during her successful campaignfocused on being relatable to the "working-class struggles" of fellow New Yorkers, with reports falsely indicating that the family had to "fight off foreclosure" on the Bronx apartment. "In 2008, Ocasio-Cortez's father passed away from cancer when he was just 48," wrote CNBC. "In order to help fight off foreclosure on her family's apartment in the Bronx, Ocasio-Cortez took on several jobs in restaurants—often working 18-hour shifts." "With my family we sold my childhood home," Ocasio-Cortez said. "My mother was forced to move to Florida because she could no longer afford to live in New York City, remain in New York City." Ocasio-Cortez's new Navy Yard stomping ground was recently named "one of the coolest neighborhoods in the world." It has been described as the go-to place to both live and socialize for Trump staffers.